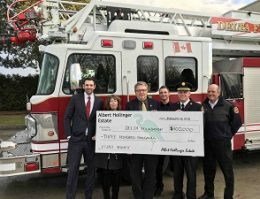 Delta Fire Department is sharing one third of $300,000, and Delta Police Department and Delta School District the other two thirds, of a gift from the estate of the late Albert Hollinger, a Delta resident of many years who died at the age of 82 in 2015. The total fund from the Albert Hollinger Estate is now transferred to the Delta Foundation which will administer the endowments and provide annual grants based on the income from the funds in three equal $100,000 amounts to the three beneficiaries. For the Police and Fire departments the funds will be used for training. For the Delta School District, a scholarship will be established to support a graduating Delta high school student pursuing post secondary education.